World of Tanks EU: Valentine II Mini Marathon? 12 Comments on World of Tanks EU: Valentine II Mini Marathon? 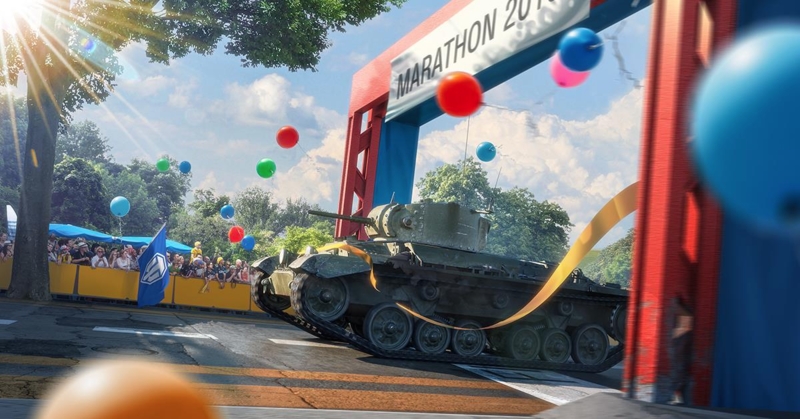 Today the Polish World of Tanks Facebook page has accidentally posted an image, that hints the upcoming mini-marathon is in fact for the Valentine II, the Tier IV Soviet Light Tank. Together with this picture, there was a small text saying “Run a marathon and get your tank for Vanetine’s day!”. After it, there was a link that directed us to an article removed from the main portal. The same URL ended with “valentine-mini-marathon”. I hope Wargaming was just using the Valentine II as “mascot” and event name for Valentine’s Day, just like every previous year, and the tank isn’t, in fact, the Valentine II. Let’s keep hoping we can actually get a new tank, like Sherman Loza’s or Tiger 217. If we have to race Valentine II like Chaffes then it will be so damn funny. Any tier 6 tank would do, a new one would be great, as long as it’s not broken like the Val II. First of all, whoa. I didn’t expect such a backlash and I’m sorry to see you all so disappointed. Our goal here was to have a mini marathon (hence the name and its short duration) that newer players can also complete, which is why we went for a lower tier tank. This wasn’t supposed to be a full-fledged marathon and we tried to lessen the “hype” so to say, by explaining that you shouldn’t be expecting high tiers or anything out of the ordinary. I can see that, even knowing this, you’re still disappointed, but I have to remind you that it was supposed to be a small event, that gives everyone something extra: new players can complete it, while those who are more experienced and already have the tank can get some useful stuff like the garage slot, extra XP, chocolate, the compensation for the tank itself, etc. What? They sell it for like 12p every Valentines day. Some marathon that will be. Day 1 fire a shot. Day 2 drive forward 1 meter. Link to the event. We got screwed over. I Hope it will be Tiger 217! I don’t really understand the wall of negativity about the event, a free tank, free boosters, what’s the problem with that? Better marathons will come up later this year so wait for them.